With the nonstop national media coverage of AOC, you’d be forgiven for forgetting she’ll actually be representing a geographically small congressional district starting January 2019 comprised mostly of Queens and the Bronx. Already the congresswoman-elect is dominating headlines of centrist and conservative publications, building massive Left-wing support while Neolibs and TradCons alike chide her for being so bold. And her agressive agenda of a Green New Deal, absolving student debt, Medicare for All, and for housing justice in her district have all been long overdue. In the age of Trump you’d think Democrats would be united in fighting back hard against Big Pharma, fossil fuels, the private insurance lobby, and Wall Street. Of course, these are Democrats we’re talking about, who just reversed a ban on fossil fuel donations. They love money as much as they love losing slam-dunk elections to reality TV clowns. Ocasio-Cortez is also just in time to use her celebrity and political power to stand firm against the extremely controversial Amazon ‘deal’, wherein the richest man on earth’s slave-warehousing company will get paid $3 billion dollars in welfare to park a new headquarters just blocks from Alexandria’s 14th congressional district. File this one under: ‘not buying it’. This week it was reported that five Walmart locations across the US are closing for up to six months due to “plumbing problems“. Some 2,200 employees were fired in the process. Most were notified only hours earlier. The big box retailer is notorious for running mainstreet American mom-and-pops out of business by operating their massive warehouse-sized stores at a financial loss for years after opening. Once surrounding local competition goes out of business, Walmart jacks their prices back up. Where the hell else in a small town is everyone supposed to shop now? Walmart is also infamous for lying about their knowledge of working conditions in the Southeast Asian sweatshops they profit from. 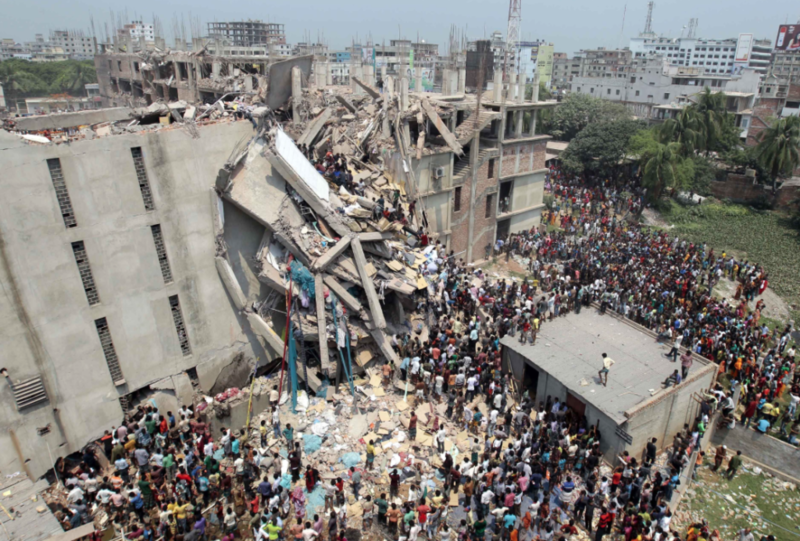 Just two years ago, a Bangladesh factory that supplies Walmart collapsed, killing some 1,100 workers. Walmart pretended to have no connection to the conditions that lead to this tragedy, until documents proved otherwise.